Nanette Boyle, assistant professor of chemical and biological engineering at Colorado School of Mines, has been awarded funding through the U.S. Department of Energy’s Early Career Research Program. 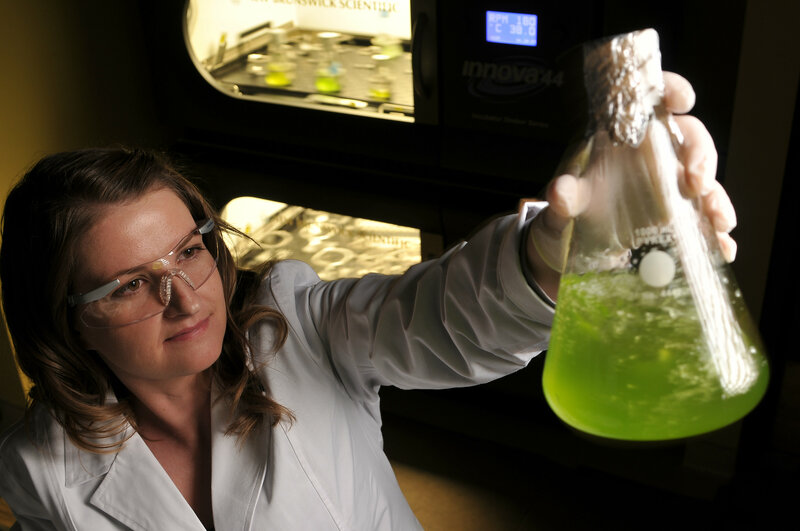 Boyle will receive $750,000 over five years to develop predictive metabolic models for algae – work that could help speed up the commercialization of strains that produce renewable biodiesel. Boyle was one of 84 scientists at universities and national laboratories across the U.S. chosen for the award, DOE’s Office of Science announced June 21. Two Mines faculty members – Boyle and Civil and Environmental Engineering Assistant Professor Reza Hedayat – received the honor, the second year in a row that the university has had multiple winners. Boyle’s research will focus on Chromochloris zofingiensis, which is valued for both its ability to accumulate a large amount of lipids, the precursor of biodiesel, as well as astaxanthin, a high-value antioxidant that is used as a nutraceutical. The metabolic model for C. zofingiensis will be developed using a systems biology approach, in hopes of predicting ways to engineer around one of the biggest challenges in growing algae compared to other organisms: changes in light when grown outside. As part of the research, Boyle will also conduct large-scale outdoor tests at the DOE-funded algae test bed, AzCATI, at Arizona State University, where Boyle completed her undergraduate studies. Boyle joined the Chemical and Biological Engineering Department at Mines in 2013. She received her PhD in chemical engineering from Purdue University and did postdoctoral research at University of Colorado and UCLA. Her work at Mines focuses on genome engineering approaches – synthetic biology, systems biology and metabolic engineering – to designing photosynthetic organisms capable of sustainably producing fuels, feedstocks and fine chemicals. Now in its ninth year, the DOE Early Career Research Program provides support to scientific researchers during the important early years when many do their most formative work. To be eligible, researchers must have received their PhD within the last 10 years and be an untenured, tenure-track assistant or associate professor at a U.S. academic institution or a full-time employee at a DOE national laboratory.